Making The Most of Your Life’s Space. That is the theme of blogs, podcasts and TV shows everywhere cashing in on the new wave of tiny spaces. They refer to their collection of techniques as “small space decorating” or “extreme small space decorating”. Tiny houses are all the rage and minimalism takes the prize. I love organizing, decluttering and decorating. I love seeing how these masterminds take the smallest of areas and make a beautiful space out of it. Last week while I was in Atlanta, I stayed in a hotel that lived up to that theme. It was a regular hotel room but it seemed so much bigger. It had a king size bed, a comfortable couch that pulled out into a bed, an ottomon to rest your feet while watching TV and a little portable TV tray where the legs went under the couch allowing the tray to be brought close for maximized use. There was no traditional closet as we think of it but rather an inset to the wall on both sides of the window with rods for hanging clothes and a place to keep the iron and ironing board all hidden by beautiful matching curtains. The refrigerator, microwave, coffee center were inset into the wall next to the bathroom allowing one door to double as a bathroom door and closure to the coffee center with just one effortless slide. There were shelves all the way up the bathroom wall next to the vanity and a shelf encompassing the vanity area itself maximizing every single space possible. I was impressed to say the least. It certainly had the newest industrial interior decorating style while still feeling warm and very functional. I kept finding hidden shelves and drawers everywhere I looked. And then right there on one of the shelves in the TV unit was a blue hard-bound book with the spine facing me. The Holy Bible from the Gideons. I gently picked it up, running my hand over its cover with a soft smile on my face and warmth in my heart. Of all the spaces in that room, they still found a perfect spot for God’s Word. That should be our life’s mission. In all the decorating of our homes, the search to make healthier choices in our lifestyles and the decluttering of every corner of our lives, we should always find room for God. We can be dressed in the most stylish of clothes, have the coolest of home decor and the most organized of schedules but if we don’t find room for God, we’ve missed the boat. As you start your adventure through this day, take time to make room for God. I believe He loves tiny spaces, spinach smoothies, leopard-print outfits and shiplap decor but only when He can be found in the center of it all. 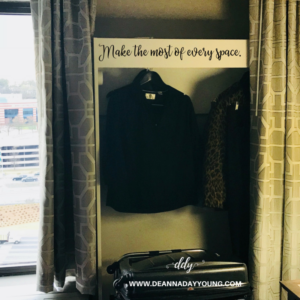 This entry was posted on March 28, 2018 with tags: #gideoninternational, #HamptonInn, #makeadifferenceeveryday, #minimalism, #shiplap by Deanna Young.